Fergus Power Pump is Your Belt Press Expert • Fergus Power Pump, Inc.
Fergus Power Pump is your one stop shop for everything involving Belt Presses! We provide Industrial Belt Presses “for sale” or “to rent”, and we also repair Belt Presses. Belt Presses are ideal types of equipment for separating water from biosolids in a variety of applications. Belt Presses operate by using a series of rollers that compress and separate out the water. Biosolids-laden sludge is pumped into the Belt Press, where it is fed along by a belt through a series of rollers. These rollers press / squeeze the water from the sludge. The water is then discharged into a centrate pan, and the dewatered biosolids are then augered into a container or truck for transfer to a landfill or a field site for disposal. 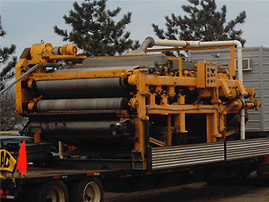 Our Belt Presses are provided with everything you need to complete your dewatering projects effectively and efficiently, including a portable flat bed trailer, touch panel controls, self-mixing polymer systems, etc. We also offer technical support for all our Belt Presses sold or rented. Fergus Power Pump can also provide consulting and engineering work to help with dewatering and/or environmental clean up projects. Contact us today to learn more about our equipment, services and how we can help you.